Recently I was asked to sample some products by the makers of In The Raw® – specifically Stevia In The Raw® – and I recreated one of the recipes from their website – the Cucumber-Mint Limeade. As someone who did a sugar detox earlier this year and in general wants to cut back on sugar consumption, I was interested in how Stevia In The Raw® would taste. In case you don’t know about it, Stevia In The Raw® is a zero calorie granulated sweetener made from the leafy green foliage of the stevia plant, which is native to South America. The sweetness is from an extract from the stevia plant leaves. The natural stevia extract is 300 to 400 times sweeter than sugar so you don’t really need as much to sweeten things up! One packet of Stevia In The Raw® is as sweet as two teaspoons of sugar but has zero calories and less than 1 gram carbohydrate per packet. Sweet (literally)! Due to it’s natural sweetness, Stevia In The Raw® can be a great product for sweetening up summer beverages, desserts, and a replacement for sugar in other recipes. Today I’m just mixing it up with a little summery beverage. A cucumber mint limeade! 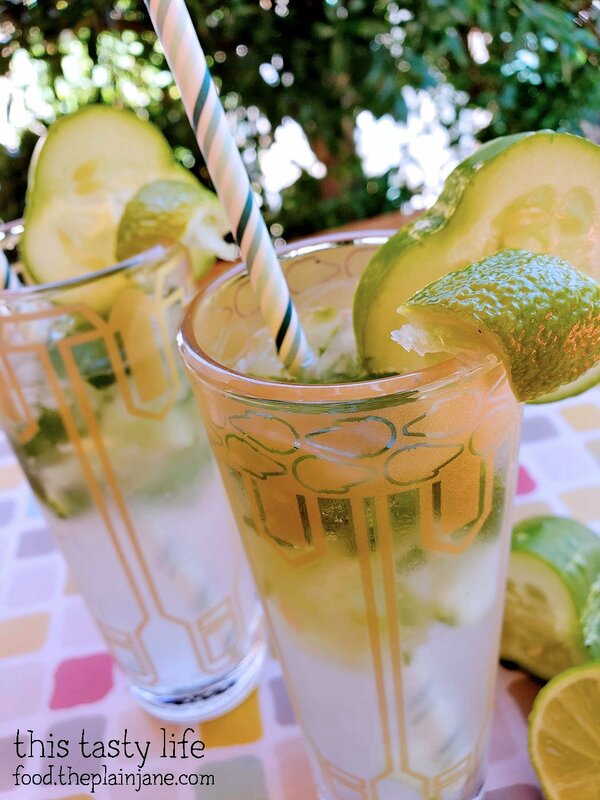 I actually had most of the ingredients for this beverage in my parent’s garden – we’ve been growing cucumbers this summer so I used a cucumber and some fresh mint, both fresh from the garden. We do even have a key lime tree, but the limes weren’t ready to be picked, so the lime is from the store. The only other thing I needed was some sparkling water and some packets of Stevia In The Raw®. I made two servings of this drink. First, I placed the lime juice into my neat Star Wars glasses along with one packet of Stevia In The Raw®. The Stevia In The Raw® quickly dissolved in the lime juice. I noticed later that there was no graininess, which you sometimes get with undissolved sugar. After that, I added some cucumber and mint and muddled the two in the bottom of the glasses to release the flavor of the mint and cucumber. Crushed ice was added along with sparkling water. Each glass was topped off with a cucumber slice, a wedge of lime, and another mint leaf. I gave a glass to my dad and we tried the drinks out. My dad could have SWORN there was gin in here, but I said nope… it’s non-alcoholic! We both enjoyed the overall flavor of the drink – the cucumber and mint mixed together well with the lime juice to create a refreshing and lovely beverage. It wasn’t too sweet and just sweet enough to contrast with the lime juice and take off any bitterness that could have been present. I liked that there was no graininess and it was a smooth flavor. I noticed that in Stevia In The Raw®’s recipe they didn’t muddle and they used cucumber flavored sparkling water, something that I couldn’t find at my local market. 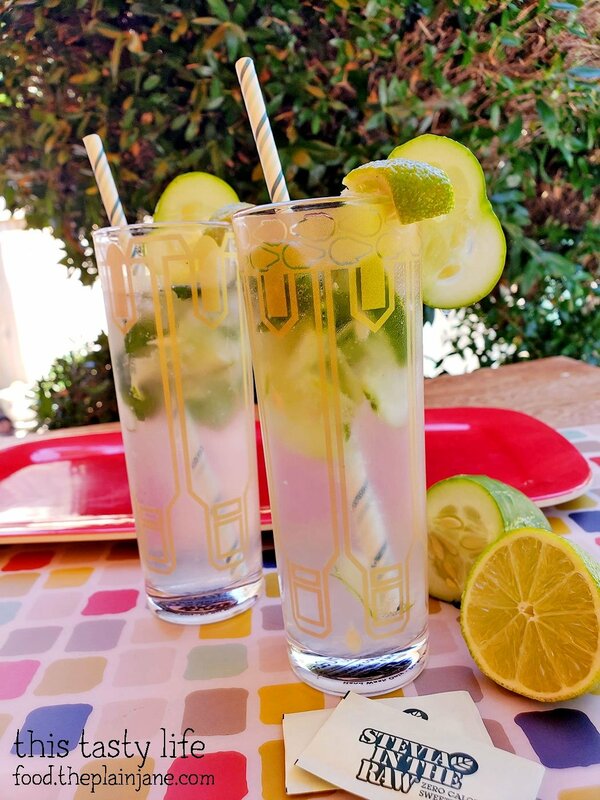 I believe that the muddling helps release the flavors of the mint and cucumber to kick up the flavor in the beverage, so I recommend you do that when you try this recipe out! All in all I can say that I enjoyed the Stevia In The Raw®. I was a bit skeptical about it, I thought it would have a weird aftertaste, but I didn’t really detect any off flavors or aftertaste. Usually I try to have unsweetened beverages, but I believe this could be a nice replacement for sugar to add a little touch of sweetness in my drinks. Thanks, In The Raw®, for providing me with the opportunity to sample your products and let me try it out for myself! Find out more information, visit their website at InTheRaw.com. In each glass, combine 1 tablespoon of lime juice with 1 packet of Stevia In The Raw®. Stir until stevia is dissolved. Add a couple of cucumber slices and 3 mint leaves to each glass. Using the handle end of a wooden spoon, gently press the mint and cucumber together to muddle. You just want to release the flavor of the mint and crush a bit of the cucumber in the bottom of the glass. Add crushed ice and top off with sparking mineral water. 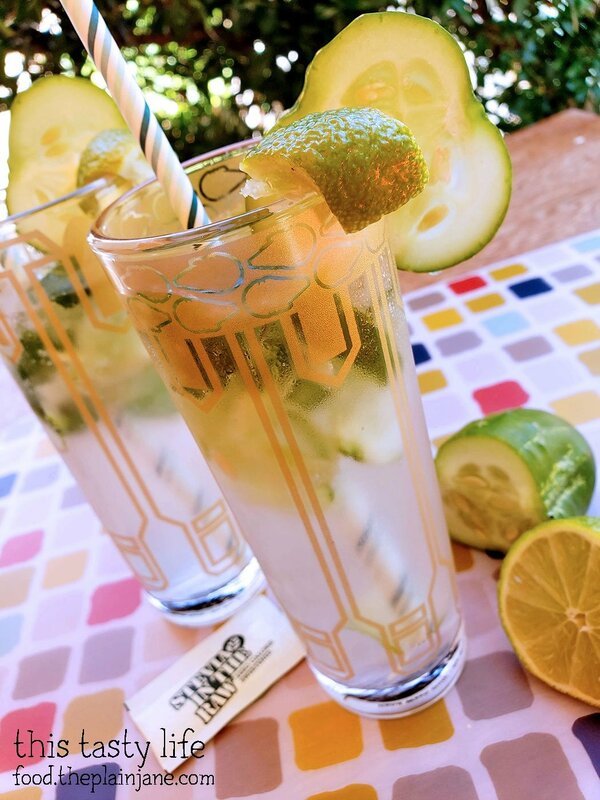 Garnish with a slice of cucumber, a wedge of lime, and a sprig of mint. 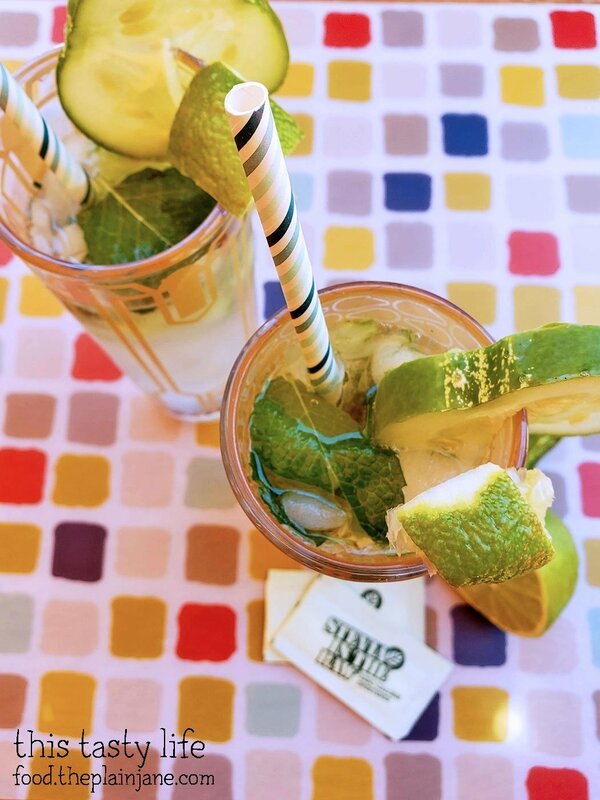 Add a fun paper straw and sip away! Disclaimer: The product, information, and a gift card have been provided by the makers of In The Raw® so that I could try the product and share my thoughts and information about Stevia In The Raw®. The opinions expressed in this post are my own and do not reflect the opinions of the makers of In The Raw® sweeteners.